Blue Gecko Bar,Ho Chi Minh City (Saigon). Vietnam. Australia Day. January 26, 2012. Perth, Western Australia. 11am (approx.). I’m in the Murray Street Mall with my wife. A young man with a striking mop of blonde hair, drunk, shirtless and with his mate urging him on yells racist obscenities at an old man of Middle Eastern appearance sitting on a bench, minding his own business, looking after his grandchild asleep in a stroller. The old man does his best to ignore the verbal barrage. The youth hits the old man and kicks over the stroller in the name of Aussie Pride on our national holiday. His mate sees some sense through his drunkeness and drags the offender away before the few observers do. The old man is unhurt but rattled and people tend to them both – the sleeping baby is awake now and crying, but unhurt. The offender is dragged away by his friend but keeps trying to attack anyone who’s not white while his friend restrains him. I know a place nearby where police can often be found, but I’m with my wife who is Vietnamese and our own baby is asleep in her stroller. I want to get the police but don’t want Aussie Pride to hurt my wife or kid. We work out a way to get around them, alert the police and catch the bus home. Later, we’re at the Survival Day Concert and it’s rocking. A few thousand mostly Indigenous people dance along to great music by Indigenous bands on a big stage, celebrating their culture and the very fact that they still exist, that they have survived. Tourists from overseas wear big smiles and take photos of cheeky kids who run around like mad – they won’t forget this day. As an event manager it’s one of the more fun events I’ve ever been to. Over the next few days I scan the local papers to try to find a write-up about the Survival Day Concert – I find scant mention about this major event that happened in the middle of the city. I guess the papers just want to stick with the ‘bad aborigine’ angle they present on a daily basis, or maybe I just dreamed the Survival Day Concert even happened. Australia Day a year later. January 26, 2013. Perth, Western Australia. 8pm (approx.). I’m with friends, my wife, our baby daughter and hundreds of thousands of others in the park that runs along the Swan River at the base of the city. We’re waiting for the fireworks to start, the music is pumping through loud-speakers, there are people from all corners of the globe, of all religions and races, wrapped in Australian flags, eating food from all over the world on picnic rugs, having a ball. It’s brilliant. I love the diversity of this city and how people from everywhere can live together without any sense of tension or menace – it could be a model for communities worldwide. Same night, later, after the fireworks. My friend is buying ice-cream for her daughter. Her husband stands nearby with his Burmese looks and Cockney accent. A few metres away, Aussie Pride stands next to me and says to his friend “I’m gonna fight with that guy”, while pointing at my Burmese looking mate. I move closer so I’m ready to protect my friend who doesn’t know he’s about to be attacked. Perhaps sensing that it wasn’t going to be as easy to fight my friend as he first thought, Aussie Pride changes his mind and looks for another Asian to fight. Same night, fifteen minutes later, everyone is crowding Barrack Street in a slow procession home. A different Aussie Pride guy attacks a popcorn stand manned by a person of middle-eastern appearance – smashes all of the popcorn filled cups from the makeshift counter, yells some unintelligible abuse and runs off like a coward – problem is he’s too drunk and falls over. A few people are helping the popcorn stand man, but most shuffle on. Maybe a few would try to remonstrate with the bogan over his deplorable act, but he’s fallen over again and cut his head open – there’s no point taking issue with a guy who’s doing a fine job of beating himself up. Aussie Pride. My Burmese-looking buddy, his German/British wife, my Vietnamese wife, our mixed race kids and I go and eat some Korean near Chinatown, because that’s what Australia Day means to us; a freedom to enjoy the best things of many cultures. 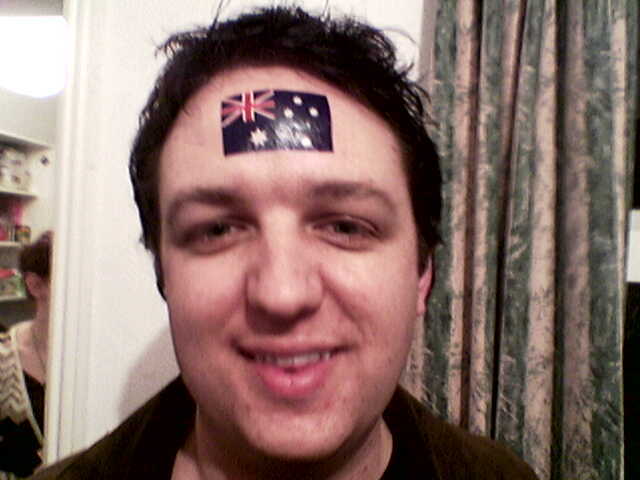 When I was younger I loved Australia Day. 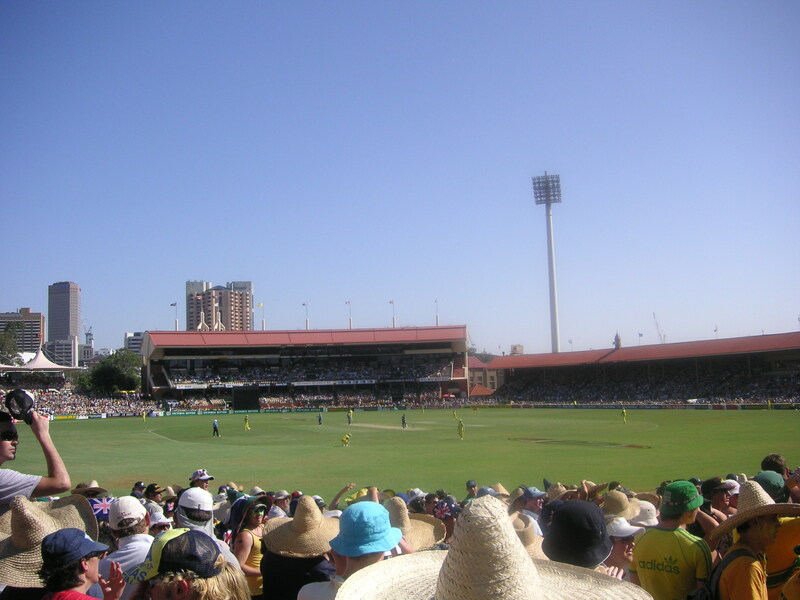 From when I was old enough to smuggle booze past security guards the day was usually spent watching the cricket from the hill below the scoreboard at the Adelaide Oval. Adelaide, cricket and Australia Day have been synonymous since the Bradman era. Some of the best days of my life were spent on that hallowed strip of lawn, watching the action, listening to Triple J’s Hottest 100 – my annual day of ultimate blokiness between art history classes and catching the ballet at the Festival Theatre. View from the hill at Adelaide Oval. 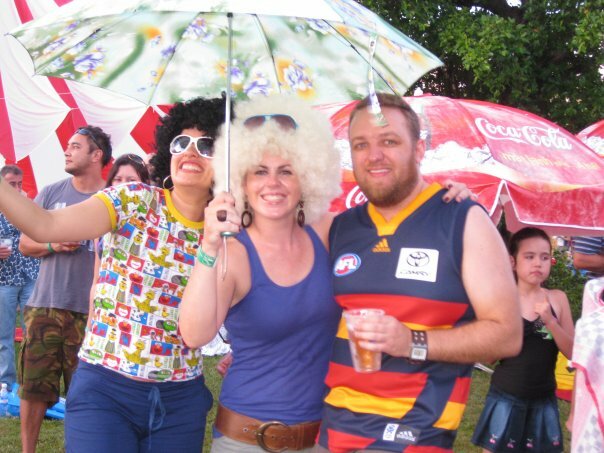 Australia Day 2006. 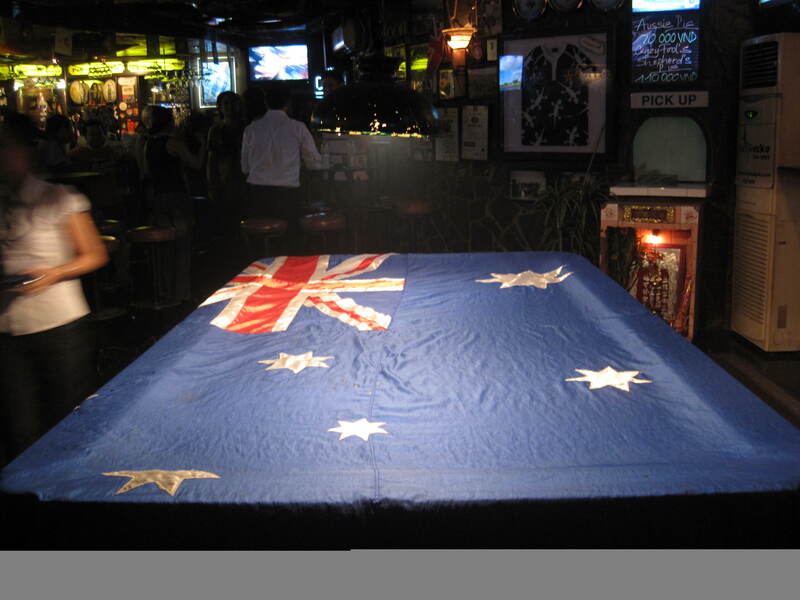 When I moved overseas the Aussie expats kept up the Australia Day traditions. We organised a rockin’ night at the Botanic Hotel in Belfast for a couple of years running – trudging through snow and ice to get there. The author, Australia Day 2005. Belfast, Northern Ireland. 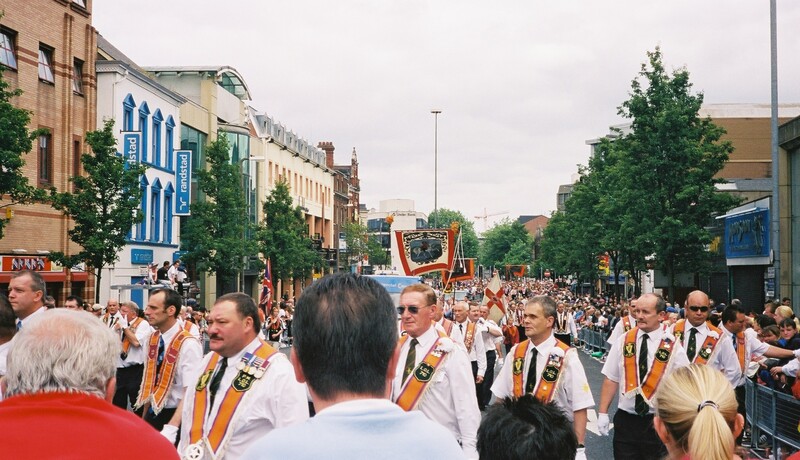 Here’s something my time in Northern Ireland left me – I hate the sight of flags. In Northern Ireland, flegs are used to divide, demarcate who owns what bit of turf, show who can safely go where and who can’t and delineate themmuns from ussuns. It’s pathetic, horrible and it’s ongoing. When people say they feel threatened by the Australian flag being flown on Australia day, I understand what they mean. Just like in Northern Ireland, there are those in Australia who use the flag as a symbol to divide the community into ‘them’ and ‘us’. Orange Parade. 12 July, 2003. Belfast, Northern Ireland. I worked for the Australian Government in the Indigenous Arts and Culture Branch of the Ministry for the Arts. This Perth office, which worked solely with Indigenous artists and cultural groups, was closed down by the Abbott Government in June 2014. Initially with the Department of the Prime Minister and Cabinet I facilitated government funded arts projects with Indigenous Australians. Many of the Indigenous people I worked with were of the Stolen Generation and when you spend time with Indigenous communities and people of the Stolen Generation, your enthusiasm for celebrating Australia Day will wane – it’s inevitable. I currently live in Vietnam. I’m the only Aussie I know in the town where I live, so there won’t be any Australia Day party here for me. I could go down to one of the parties in Saigon which are great networking events for a business owner like myself, but I have no enthusiasm for these celebrations. Aussie Pride tells us “Australia; love it or leave”. Well, I left; do I love Australia? Aussie Pride assumes that our relationship with something as unwieldy and complex as a country can be easily explained in a few words. I absolutely love Australia and hope to raise my kids there, but there are things I hate about Australia like cowardly, racist Australia Day violence against the elderly and babies in strollers. I work in corporate cultural diplomacy. The homeland of any particular corporation reflects on their business. If a nation acts in a way that diminishes its international reputation, it diminishes the reputation of its companies. Australia spends millions of dollars internationally every year talking up Australian companies and promoting Australia as an attractive place to travel and do business. Cultural Diplomacy, in which the government also invests, albeit modestly, builds international people-to-people, business-to-business and government-to-government links, in order to improve Australia’s reputation and influence abroad. But where does cultural diplomacy begin? In Vietnam I have to watch the English speaking news services of CNN, the BBC and the like since the Abbott government closed down the Australia Network. Australia’s often poor treatment of Indigenous people and foreigners is widely noticed in the outside world and this reflects on our businesses operating abroad and ultimately on all of us. I once went to an Asian supermarket in Adelaide to buy some Vietnamese coffee and a Chinese herbal sleeping remedy. The guy at the checkout looked at me like I was an idiot and said “Why don’t you leave both of these with me and save your money son?”. That’s how I feel about Australian cultural diplomacy. The millions we spend and the positive work we do overseas is largely negated by our actions or inaction back home. Cultural diplomacy begins at home. The best way that Australia can improve its international reputation, the business reputations of its companies operating abroad, it’s attractiveness as a tourism, study and investment destination, is to ensure that Indigenous people are respected and those who come from elsewhere are made welcome.